For For the Japanese Sega Master System game, see Hokuto no Ken (Master System). For the "Black Belt" console, see History of the Sega Dreamcast/Development. 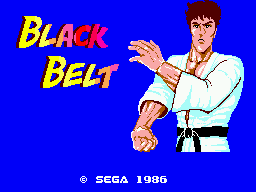 Black Belt is a beat-'em-up action game developed and published by Sega for the Sega Master System. 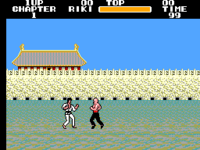 It is a reworked version of Hokuto no Ken, with different graphics and audio, removing the Hokuto no Ken license in the process and turning it into a martial arts game similar to Irem's 1984 arcade game, Spartan X/Kung-Fu Master. Main article: Black Belt/Magazine articles.